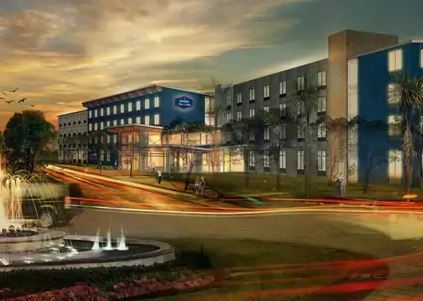 Hampton by Hilton, the global upper-midscale brand known for its commitment to providing unmatched guest service, debuted its newest property, Hampton Inn & Suites by Hilton San Diego Airport Liberty Station. Managed and developed by InterMountain Management, Hampton Inn & Suites by Hilton San Diego Airport Liberty Station features 181 spacious rooms and offers travelers value-added amenities with the spirit of Hamptonality. Hampton Inn & Suites by Hilton San Diego Airport Liberty Station is located at 2211 Lee Court, adjacent from Spanish Landing and less than a mile from the San Diego Airport. The Nimitz Bridge connects the beautiful property to the heart of Liberty Station. The hotel features custom design décor, a state-of-the-art fitness center, a board room for small gatherings, and an outdoor pool.